Har-Ki-Doon trek, renamed and re-designed as Kedar kantha trek since 2006 in an annual event in YHAI calendar. True to the objectives of YHAI, the trek provides a great opportunity for adventure, scenic beauty, and a firsthand experience of remote villages of Gharwal Himalayas, in spite of the fact that the trek has been shortened by eliminating the Har-ki-doon for the convenience of the trekkers. 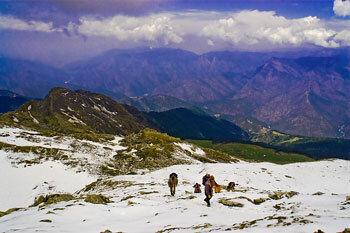 Kedarkantha trek starts from May 1st, and groups start on every day of the month. The programme lasts 12 days, starting from the day of reporting at Mussoorie Youth Hostel. We reported on 9th of May and were identified as KK-9 group.